Suja Varunee is an Indian film actress best known for her works in Tamil cinema. Being debuted as a child artist, she has appeared in dozens of films in South Indian languages – Tamil, Kannada, Telugu, and Malayalam. Suja appeared in Kamal Haasan hosted TV reality show ‘Bigg Boss Tamil’ as the wildcard contestants. She was born on 11 October 1984, in Chennai, Tamil Nadu, India. Her education details are unknown. Siblings – She has one younger sister. 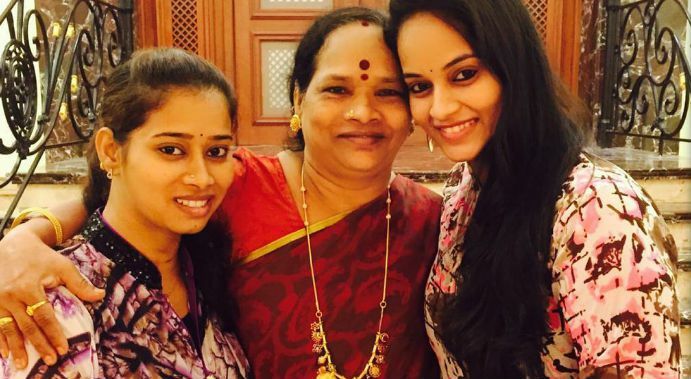 Suja Varunee married actor Shivaji Dev, the son of film producer Ramkumar Ganesan, on November 20, 2018. They have been in a relationship for over 11 years. Dev is the grandson of legendary actor Nadigar Thilagan Sivaji Ganesan. She wears a shoe size 7.5 (US). Suja Varunee made her onscreen debut with the 2002 Tamil film Plus Two. She has acted in a number of film in supporting roles. She has also done songs with many top actors in the industry. She appeared as a contestant in the first season of Bigg Boss Tamil, a reality show hosted by Kamal Haasan. Suja Varunee began her acting debut at the age of 15 in Tamil film Plus Two. She had appeared in hero introduction songs in several movies in all fout south Indian languages. She got her break in 2010 Tamil film Milaga and went on doing supporting roles in several movies. She has also worked in TVC ads with several brands including Aarasan Soap, Saravana Store Elite, Sun gold covering, Nizam Pakku and Government TVC. Suja is a good badminton player and often hang out with friends when not in shoot. She was one of the wildcard contestants in the first season of Bigg Boss Tamil hosted by Kamal Haasan. She was accompanied by Harish Kalyan and Kaajal Pasupathi in the show as the wild card contestants.